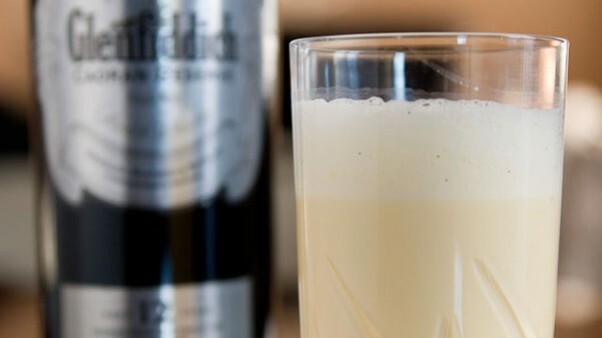 Eggnog is a drink that most people either adore or despise; there is rarely a middle ground. 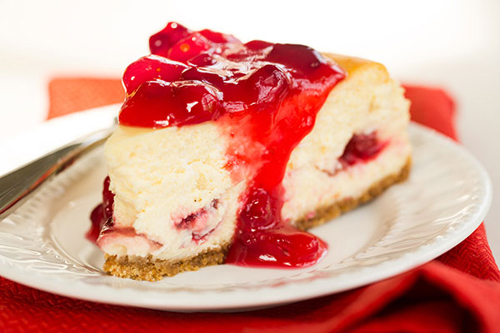 It’s not difficult to understand why some folks are wary of the rich and creamy holiday drink. The combination of raw eggs, milk and sugar might seem strange, until one realizes that unfrozen ice cream has the same basic components. Those who fall on the side of loving eggnog look forward to winter, when grocery store coolers fill with every variety of the drink they can dream of. 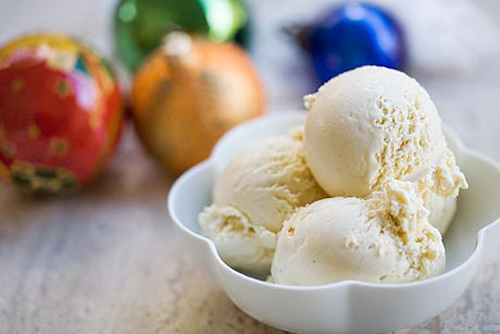 From pumpkin eggnog to organic to dairy free “soy” nog and yes, even eggnog-flavored ice cream… there are many delicious options to toast the holiday season each year. 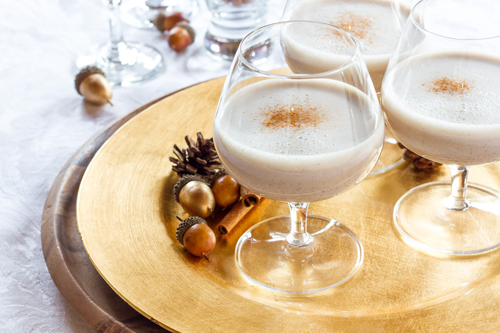 Most culinary historians agree that eggnog began as “posset” during Britain’s early medieval years, but beyond that there are many differing opinions regarding the origins of the festive drink. According to the Oxford English Dictionary, posset was “a drink made of hot milk curdled with ale, wine, or the like, often sweetened and spiced.” Down the line, it may have been monks who added in the whipped eggs. 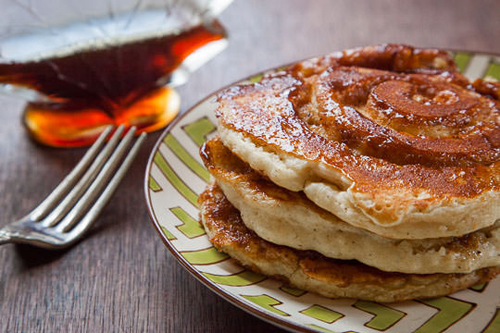 They are also said to have thrown figs into the mix. What we do know for certain is that posset was more popular in the upper classes due to the expensive price of milk, eggs and sherry at that time. Because of its hefty price tag, posset was often used in toasts to good health and prosperity. As eggnog’s popularity began to wane overseas, it found a new following in the American colonies. Many American families had their own farms to supply them with the milk and eggs needed to whip up a nice batch eggnog. Sherry and Madeira were not easy to come by in the colonies; these liquors were replaced with less expensive and more widely available whisky and eventually rum. According to kitchen records, George Washington served an eggnog-like drink to visitors at Mount Vernon complete with sherry, rum and rye whiskey. By the 19th century eggnog was associated with the holiday season, a tradition that continues to this day. Americans love eggnog so much that it caused a riot in 1826. Prior to that year, cadets at West Point upheld an annual tradition of indulging in spiked eggnog during their Christmas festivities. The tradition was challenged when newly appointed superintendent Colonel Sylvanus Thayer forbade the consumption, purchase and storage of alcohol at West Point. Instead of adhering to Thayer’s new rules, cadets smuggled in alcohol from nearby taverns. Some even traveled across the Hudson River to be sure they had enough whiskey to get them through the night. Thayer had a feeling that the cadets might disobey his orders and sent two officers to look out for any unusual activity. The night took a rowdy turn, complete with broken windows, fights and more than a few hangovers. In the end 19 cadets were expelled and, perhaps not surprisingly, West Point no longer hosts a large holiday celebration. The raucous event will forever be known as the Eggnog Riot. Outside the United States you’ll find other drinks similar to eggnog. 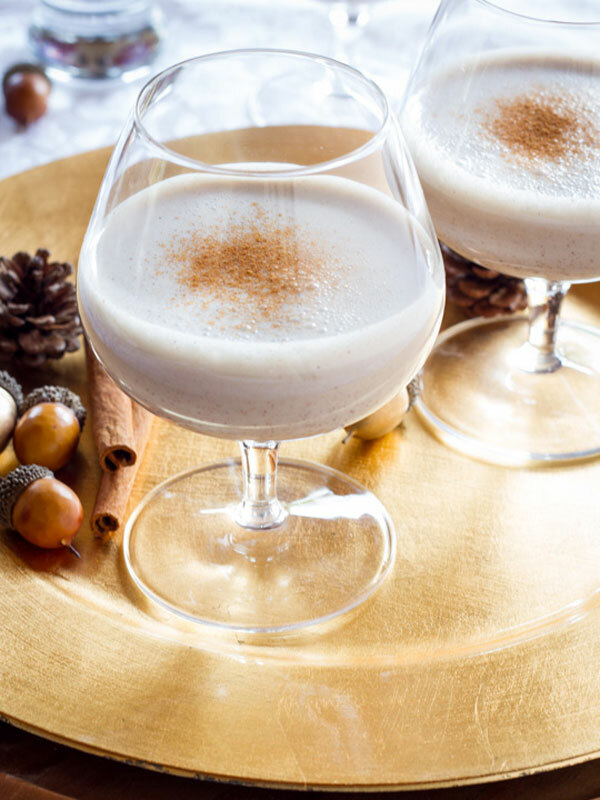 In Mexico there is a vanilla-flavored beverage known as rompope; in Puerto Rico folks enjoy coquito, a drink similar to eggnog with the addition of coconut milk. 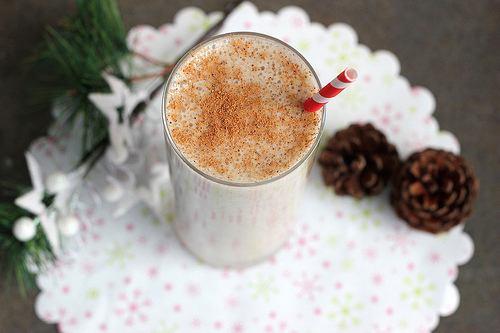 If you’re not crazy about drinking traditional eggnog, you might try cooking with it. 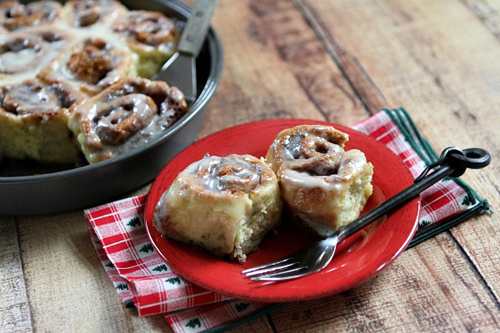 There are many creative ways to incorporate the sweetly spiced flavor of eggnog into desserts or baked goods, as demonstrated by some of my food blogging friends below. 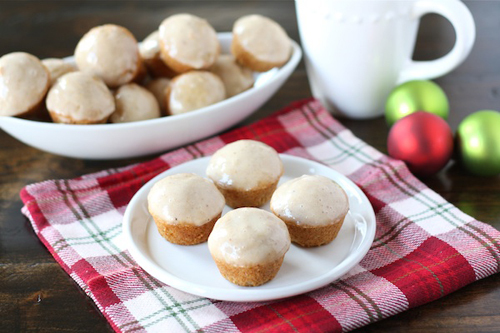 These eggnog-inspired ideas truly capture the flavor of the holiday season. Cheers! Funck, Carol S. “The Eggnog Riot.” ARMY.MIL, The Official Homepage of the United States Army. U.S. Army, 22 Dec. 2010. Web. 16 Dec. 2014. Smith, Andrew F. The Oxford Companion to American Food and Drink. Oxford: Oxford UP, 2007. Print. Staib, Walter, Molly Yun, and Diana Wolkow. 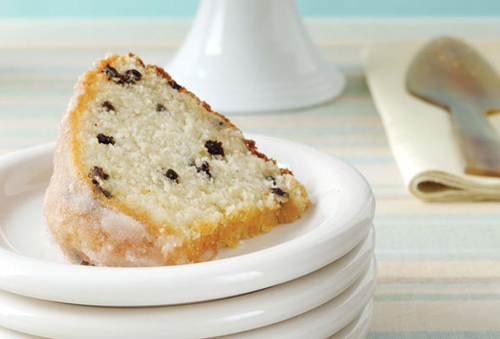 A Sweet Taste of History: More than 100 Elegant Dessert Recipes from America’s Earliest Days. 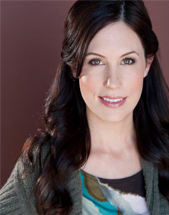 Lyons Press, 2013. Print. Weld, Isaac. Travels through the States of North America and the Provinces of Upper and Lower Canada, during the Years 1795, 1796, and 1797. London: J. Stockdale, 1799. Print.